Conor Washington scores against Preston in the FA Cup. Photo: Joe Dent/theposh.com. Peterborough United manager Graham Westley will have mixed emotions if top scorer Conor Washington is sold in the January transfer window. Westley would be ‘delighted’ to see a player he has helped develop, hit the big time, but he’d be ‘disappointed’ to lose his in-form striker from his gifted young squad. Posh boss Graham Westley will have mixed emotions if Conor Washington is sold. Photo: Joe Dent/theposh.com. 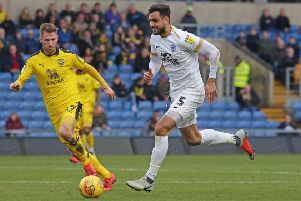 Posh reportedly rejected three multi-million pound bids from Championship clubs for the 23 year-old before he delivered further proof of his rapid improvement with a superb headed goal in last weekend’s (January 9) 2-0 FA Cup win over Championship side Preston. That was a 13th goal in his last 14 appearaces for Washington, form that has attracted attention from Birmingham City, Cardiff City and Reading among others. “Who knows if Conor will even be here this weekend,” Westley stated. “The transfer window is a very difficult thing to predict. Did Wolves expect Benik Afobe to leave for Bournemouth last weekend? “Things can move very quickly or they can drag on. The good thing about Conor is that all the speculation won’t affect him. “If I was a club watching him against Preston I would have seen a player who was very focused and very committed. It can be hard to focus when you are the subject of so much speculation, but Conor coped well. “In a way I would be delighted if Conor got a good move. He’s a very talented lad, a very pleasant lad, and it would reflect well on the club if we sold him because it would be another player who has developed impressively with us. “Obviously I would also be disappointed to lose such a good player, but this club has handled the loss of outstanding players before. “We won’t be giving away any of our players, but we also won’t be standing in their way if acceptable offers arrive. “That’s what we do and if we keep playing as well as we are currently, there will be an awful lot more speculation, and maybe some serious offers, for our players. “One decision Conor has to make is whether he wants to go into the Championship, or would he better off waiting for the inevitable interest from the Premier League? A player with his scoring record will always be of interest to big clubs. It’s understood Championship clubs are also tracking Posh winger Marcus Maddison. Posh have been linked with numerous possible replacements should Washington be sold, but chairman Darragh MacAnthony distanced the club from Exeter City’s Tom Nichols and Scunthorpe’s Paddy Madden this week.